Some of you might remember that line from old Monty Python sketches. It seemed an appropriate title for this blog post because, for one thing, this post has virtually nothing to do with what I am doing in Cambodia, and for another, I fondly remember the subject of this post's doing his fair share of Monty Python impersonations back in college. I've had a lot of things on my mind here in Cambodia recently. Some of them I've already blogged about, some I'm still wrestling through how to blog about. Most relate to the challenges I see ahead as I move closer and closer to the role that I've anticipated having here in Cambodia. But one of the things that has been on my mind a lot is the ongoing battle of my college friend, Charlie Kurtz, to recover from a brain aneurysm he sustained a little over a month ago.I was shocked and so very, very sad when I first heard about it. Probably only a month prior to that I had received such a warm, encouraging, and spiritually sensitive e-mail from him. It was extremely painful to suddenly hear that he was fighting for his life. I signed up for his CaringBridge website and have been eagerly following every journal post. I knew Charlie to be a warm, funny, engaging guy who loved and served Jesus with a passion and this became very clear to all of the hospital staff involved in his care and everyone watching his journey of healing. 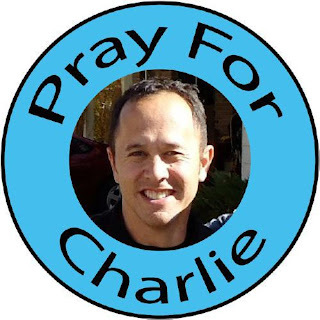 I almost expected that God might just do something really amazing, in part, because of how Charlie and his wonderful friends and family were putting Him in the spotlight. I know that God is faithful in tragedy as well as in triumph and I prayed for His comfort for Charlie's sweet family and friends whatever the outcome. It's just the beginning of a long slow journey, but it appears that the Lord is really bringing triumph out of tragedy and what I'm so impressed about is how Charlie just exudes Jesus Christ, even while he's still battling memory deficits and confusion at times. It has only been recently that Charlie has regained the ability to talk and it is clear that Jesus is one of the foremost things on his mind. Wow, do I ever want that to be true of me! One of his statements to his wife was, "is God using us right now to magnify his name?" Yes, yes, my friend, an emphatic yes!!! I can't thank God enough for you and the encouragement of seeing your love and faithfulness to Him and vice versa. Whether alive and well or on the brink of death I want my life to shine for Jesus the way yours has. There's a long way to go, but Charlie appears to be making really wonderful progress and I pray that he will continue moving steadily forward. Please pray for Charlie and his family as he continues the hard work of rehabilitation while clinging to the hand of his Savior and boldly proclaiming His name. Pray for his emotional, physical, and spiritual well-being throughout the course of this journey. Since I've been writing lately about what I've learned in recent weeks about the problems associated with many orphanages here in Cambodia and extolling the benefits of family/community-centered care, I thought I'd share a bit about how the organization with which I work, Children in Families, is helping to address this need. Children in Families was started in 2006 by Cathleen Jones who recognized the need to move away from institutionalized care for children in part from her own prior experience as an orphanage director. Currently we are helping over 200 children to live within safe, nurturing, family environments through our kinship care and foster care programs. Kinship care involves providing support to extended family members such as grandparents or aunts and uncles when a child does not have a living parent willing or able to care for him or her. Foster care involves supporting couples and families who wish to provide a good home to a child who has no living relatives willing or able to care for him or her. In both scenarios families receive assistance for food and school expenses for the children, as well as regular follow up from our Cambodian social work staff, including access to ongoing family education. When a child is referred to CIF (generally by government agencies, NGOs, or local officials) a CIF social worker investigates to determine if the child has any living family members potentially able to care for him or her. The child is placed into an emergency care family while his or her particular needs are assessed and, if family members have been identified, they are counseled to determine if the child can be successfully and safely reintegrated into the family framework. If the child is a candidate for kinship care this is preferable as it allows the child to remain connected with those already a part of his or her life. If not, the child is placed in a carefully screened foster family. In either case the family has a contract with Children in Families which outlines expectations and responsibilities. Children in Families has worked to develop good working relationships with local government officials and is in compliance with national standards of care. There is a lot more to be done and we partner with other organizations which have the same commitment to promoting community and family-based care in order to collaborate and maximize our efforts. We would like to grow in our capacity to reach more children and families and to facilitate the development of other similar programs all across Cambodia. If you would like to find out more about Children in Families and/or how you can help to support community and family-based care in Cambodia please click here to check out our website. There is some good information about family-based care on the Resources page.